75% of business buyers conduct more than half of their research online before making a purchase. What Are Your Observations from AWS Re:Invent 2016? What Would You Like to Feature in Cloud Journal? Please let us know what topics Cloud Journal should cover. Do you have a new perspective? A new innovation to share? A unique service offering? The Cloud Journal regularly publishes articles that discuss the business challenges of migrating to the secure cloud. Our experienced writers create articles, written in your voice and for your audience. 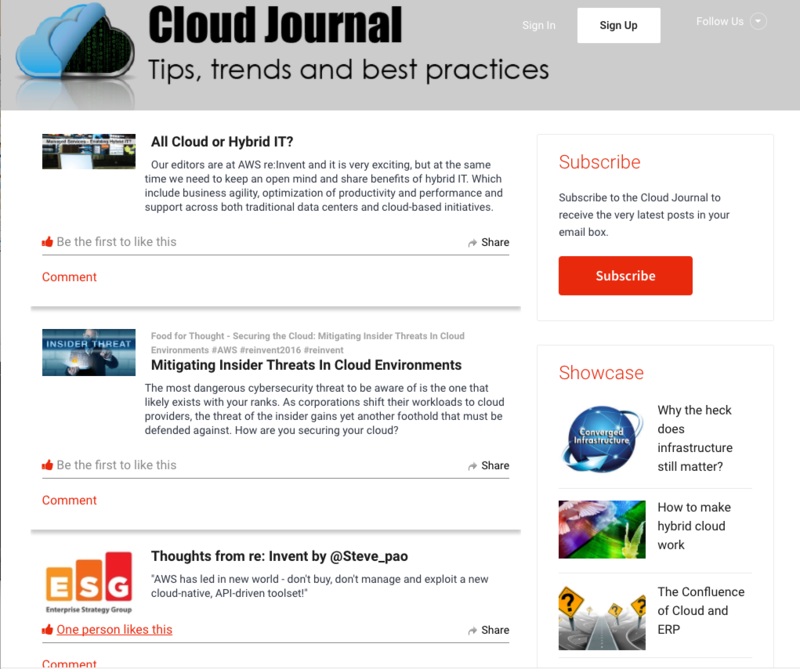 The content is published to your blog and featured on CloudJournal.org. An email newsletter that features Cloud Journal content is emailed every month to thousands of IT professionals to drive traffic. CloudJournal.org was created as a content hub for cloud content that speaks to the business problems your audience will face. ContentMX is the leading producer of technology content for Cloud, Big Data, IoT, and CyberSecurity solutions. Our clients have seen as much as a 225% increase in sales leads and 90% of clients surveyed experience improved customer loyalty with our innovative end-to-end content marketing solution. Let us help you drive leads with insightful cloud content.